Valentine's Day 2019: It seems like the most-talked-about couple Virat Kohli and Anushka Sharma had a ball in New Delhi. 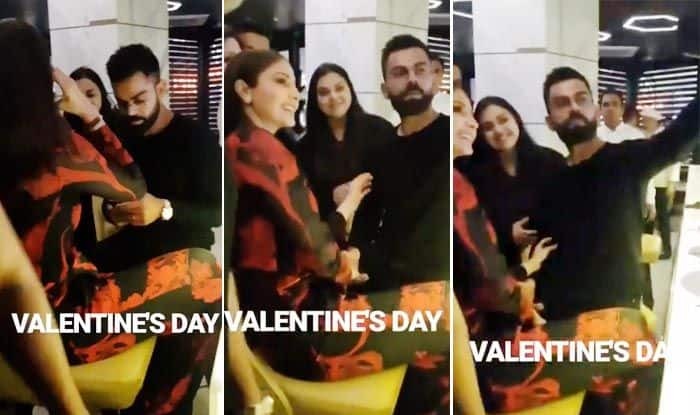 Valentine’s Day 2019: It seems like the most-talked-about couple Virat Kohli and Anushka Sharma had a ball in New Delhi. The couple spends the special day with close friends at Nueva, the cricketer’s restaurant. While Kohli’s friends were spotted dancing like there is no tomorrow, the Indian skipper turned cameraman for Anushka Sharma during the celebrations as he was seen clicking selfies. Kohli will soon lead the Men in Blue when Inda host Australia for a limited-overs series starting February 24. The couple recently returned from New Zealand where India was on tour. Anushka Sharma was with the Indian captain during the series. The Bollywood starlet was also spotted at grounds in Australia and New Zealand rooting for the Men in Blue. Meanwhile, Kohli will soon be seen leading the team after a well-deserved break during the upcoming Australia series, where the Men in Blue will host the kangaroos in a two-match T20I series followed by five ODIs. Kohli is currently the No 1 batsman in the world and India would be hoping he does to the party later in the year at the World Cup stage. Virat Kohli bagged all top three ICC Awards – the Sir Garfield Sobers Trophy for ICC Cricketer of the Year, the ICC Men’s Test Player of the Year and the ICC ODI Player of the Year – for his performances in 2018, it was announced on Tuesday (January 22). In addition, the India captain was also named the captain of the ICC Test Team and the ODI Team of 2018. Kohli became the first player to win all three awards together after accumulating 1322 runs from 13 Tests, 1202 from 14 ODIs and 211 from T20Is.